"The most important development of the past century has been both ..... simple and profound. It has been the spread of democracy. Democracy hardly makes the world perfect, but it tends to engender open economies and more respect for human rights. Ultimately, democracy promises to make the world more peaceful, for democracies are less likely to go to war against each other than are totalitarian regimes." President Paul Biya has dominated politics in Cameroon since 1982 when, as then prime minister, he was appointed president of the one-party state following the unexpected resignation of President Ahmadou Ahidjo. 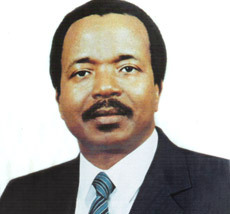 Biya won election to his first full term as president in January 1984 and was re-elected unopposed in 1988 with 98 percent of the vote. Despite Biya's reelection, dissatisfaction with the government increased significantly as economic crisis and repression worsened. As the Cold War ended and a wave of democratization began to sweep across Africa and other parts of the world, Biya reluctantly permitted the formation of political parties in 1990, after several attempts by his government to crush the movement for multiparty politics in Cameroon. The first multiparty presidential and legislative elections were held in 1992 and were administered by Cameroon's Ministry of Territorial Administration (Interior), despite requests by the opposition for an independent election commission to conduct the poll. Amidst widespread reports of electoral fraud, Biya narrowly defeated his main rival by 39 to 36 percent. International election observers monitored the polls and concluded: "The Cameroon government, for which President Paul Biya bears ultimate responsibility, took unusual extreme and illegitimate actions to ensure the president's victory. This led inexorably to the conclusion that the election was flawed to the point where its legitimacy and validity are called in question." Since that time, Biya has systematically undermined Cameroon's legal and political institutions to perpetuate his own rule. He has minimized the role of the legislative and judiciary branches of government and totally ignored input from opposition parties and civil society. He has also co-opted most of the traditional authority in the country, where 55 percent of the population lives in rural areas under the influence of powerful chiefs and lamida. In 1996, the Biya government amended the country's constitution to extend the presidential term of office from five to seven years and to allow the president to appoint one third of the Senate. While the constitution provides for an independent judiciary, the president appoints all judges and officers of the courts. Parliamentary and presidential elections were held again in 1997. Both were considered by observers to be marred by irregularities and the process neither free nor fair. In the 180-seat Parliament that emerged from those elections, the ruling party (Rassemblemeus Démocratique du Peuple Camerounais - RDPC), held 109 seats, the Social Democratic Front (SDF) 43 seats, the Union Nationale pour la Démocratique et le Progres (UNDP) 13 seats and the Union Démocratique du Cameroun (UDC) five seats. The Mouvement pour la Jeunesse du Cameroun (MLJC), the Union des Populations Camerounaises (UPC) and the Mouvement pour la Défense de la République (MDR) each held one seat. Most Cameroon observers and political analysts believed then that the allocation of seats contrasted sharply with the representation of party support across the country. In protest over the legal framework for the presidential election, the three main opposition parties boycotted the presidential election of that year. 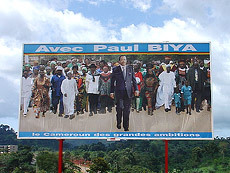 Biya’s government and the ruling party denied the massive election fraud complaints launched against them by opposition parities during legislative elections held on July 22 2007. Some of the opposition parties petitioned the Supreme Court which declared results from five districts null and void. By-elections were held on September 30, 2007 to fill the vacant seats. The current legislature has President Biya’s party holding 153 of the 180 seats, the main opposition party, the SDF, holds 16 seats and the remaining seats are held by other parties. With this overwhelming legislative majority, Biya pushed through a controversial constitutional amendment that eliminated term limits for the president. In February 2008, massive demonstrations took place in five of the country’s 10 provinces – now called regions -- in opposition to the constitutional amendment. The violent suppression of these demonstrations left many scores of people dead and many more injured. 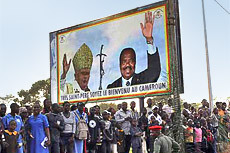 The RDPC-controlled parliament proceeded to adopt the amendment in April 2009, meaning that Paul Biya may run for yet another presidential term in 2011.